First time orders must be $200 or more. Minimum re-order is $150. We accept Visa and Mastercard. Net 30 terms are available upon credit approval. Please allow 14 days for approval. A flat rate of $9.50 is billed for shipping. Most orders are shipped by UPS Ground. Orders to Alaska or Hawaii are shipped by Priority Mail. Faster shipping can be arranged for an additional cost. Now wholesale web orders can be made on this site. All wholesale customers will have to register before they place their first internet order. The ordering features and organization have been designed to be as convenient as possible. Note that each category is numbered to represent a corresponding "sample board". To find a particular product by it's number, enter the first part of a product number into the search field. For example if you enter "1401" in the search box you will see all 28 products with the 1401 prefix as search results. (or at least 80 pieces). 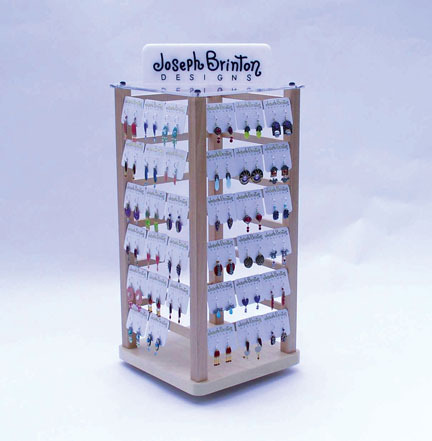 This 8”x 8”x 20” revolving display is just what you need to display our jewelry. We ask that you kindly use our display for our designs only.